Hotly-tipped Michigan rockers Greta Van Fleet have announced details of a double EP to be released in November. From The Fires features the four tracks that appeared on this year’s Black Smoke Rising EP, plus four new songs. The new material was recorded at Rust Belt Studios in Detroit and produced by Al Sutton, who’s previously worked with the likes of Kid Rock, Bob Seger, Loretta Lynn, Sponge, The Detroit Cobras and Hank Williams Jr, and Marlon Young, who lists Kid Rock, Sponge, Lynyrd Skynyrd, Uncle Kracker and Pop Evil on his CV. The pair also produced Black Smoke Rising. 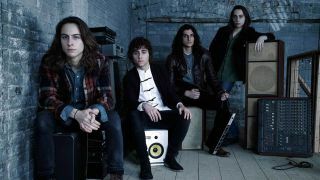 The new EP’s artwork (shown below) is inspired by camping trips the band — Kiszka, plus brothers Jake (guitar) and Sam (bass, keys) and drummer Danny Wagner — took as kids. From The Fires is released on November 10. The band are currently on tour in the US (dates below). All remaining dates apart from Tucson and Chicago are sold out.